Smitty is generally the weaker part of the partnership, where URL is the one who gets them both motivated to do their job. Unlike URL, Smitty has been fired on occasion, but was hired back on the force after capturing Robot Santa, who was actually Bender. URL revealed that Smitty took an early retirement shortly before Philip J. Fry joined the NNY Police Department (6ACV16). Somehow, he came out of retirement and rejoined the force sometime after Fry got fired (6ACV24). Shortly afterward, he and URL arrested Hubert and Cubert Farnsworth for violation of Bender's license agreement (6ACV25). He was also involved in the pursuit of Bender after he kidnapped Ben from Bev. Smitty is featured on one of the discs of The Complete Collection 1999-2009. Smitty became a cop because his father owned a restaurant where people wouldn't pay for their meals. Smitty and URL seem to ride NNYPD patrol car 718, which is an anagram for 187, the LA murder code. It is also one of the area codes used in New York City. They use batons that resemble the Lightsaber from Star Wars. Unlike their Star Wars counterparts, they are blunt weapons (like nightsticks/batons), rather than superheated blades. Smitty and URL are Fry and Bender's counterparts in some ways, as certain traits and facts tend to mirror the pair. Smitty and URL are not only friends, but also co-workers, like Fry and Bender. Smitty, like Fry, is a human male and not that bright, while URL, like Bender, is a robot male who can be cruel at times ("Space Pilot 3000"). Smitty and URL are also voiced by the same voice actors who voice Fry and Bender. Smitty is voiced by Billy West, who voices Fry, and URL is voiced by John DiMaggio, who voices Bender. Roberto: Stay back, I've got hostages! Dr. Zoidberg: Hooray, I'm helping! Smitty: Do you have any better hostages? Smitty: You're under arrest for child endangerment, depriving children of food, selling children as food, and misrepresenting the weight of livestock! Smitty: You're under arrest, you squishy punk. URL: Smells like a juicy promotion for me! 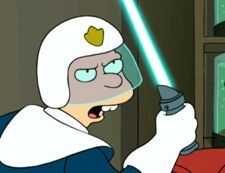 Smitty: And a juicy rehiring back onto the force for me! Centipede Man: [On TV.] C'mon, man, I didn't fire off no laser. Smitty: [On TV.] Then why is there a smoking hole in your ceiling, sir? Centipede Man: [On TV. The camera points to the ceiling.] What? Crazy upstairs lady must've been shooting down. URL: [On TV.] Sir, you're on the top floor of this particular domicile. Fry: No, no! I was just picking my nose. Smitty appears in all episodes (not counting film episodes), due to being visible in the opening sequence. The list below consists of appearances outside of the theme only.